The sound of my neighbor’s lawnmower drives me to distraction. 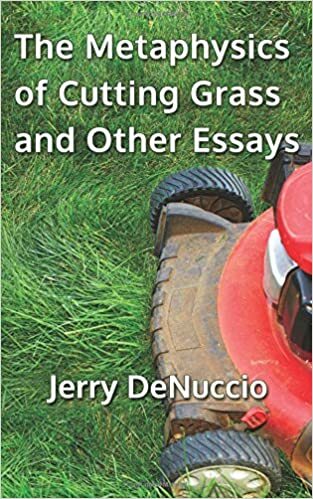 Unlike the valved syncopation of my mower, with its unwavering staccato, its steady sonic brio, his mower seesaws in pitch, rises and falls, rises and falls, repeatedly, like some undulant Pogo-stick. All summer long the octaved braying, the maddening Jack-and-Jilling, up and down, climbing and falling. The town whistle—a siren, actually—rips the day at 7 a.m., 12 p.m., and 6 p.m with a banshee wail that, depending on where you are, fattens and grows lean as the siren swivels atop its downtown tower. Dogs bark, birds are startled from their perches. It is a piercing tea kettle shriek. It is the whine of a dentist’s drill screaming over the town’s rooftops. Several years ago, in a referendum on whether to retain it, my fellow townsfolk voted their overwhelming approval. It was “quaint,” they said, “distinctive,” they said; it “embellished the town’s identity,” like the cobble stoned downtown streets which, after years of requiring an expensive annual resetting due to winter shifting, were finally coated over in asphalt. I suspect the quaintness of our ear-stilettoing town whistle provides cold comfort to those who come late to their beds or are jabbed early from them. My neighbor’s lawnmower and the town whistle may be toneless and timbreless, but at least they had pitch. A colleague with whom I sat for years on a committee had a voice without tone, timbre or pitch—perfectly flat, candenceless, without inflection or resonance, overtone or undertone, a dozy drone that could nullify the effects of the most potently caffeinated energy drink. A Medusa voice, numbing the mind to stone and accessorized by a vocal fry—a needle-raking-across-record-scratch, a cindery crackle—that began and ended each utterance. A voice that enters the ear canal like sandpaper. A voice that could turn corpuscles into chips of ice. The sounds we identify and respond to do not occur out in the world, though the process begins there. Sounds occur in our heads. We create them. The process, depending on how you look at it, is either a marvel of anatomical architecture or a Rube Goldberg contraption. An external disturbance creates sound waves that enter our ears and, passing through the ear canal, strike the eardrum, causing it to vibrate, which causes the three middle ear bones to vibrate, which sets inner ear fluid in motion, which stirs hair-like cells, which transform the vibrations to nerve impulses, which are sent, via the auditory nerve, to the brain where they are converted into the sound we hear. High-pitched squeals and raspy scrapes—the chafe of Styrofoam, fingernails on a blackboard, the shrill creak of an unlubricated door hinge—register almost universally as annoying; indeed, they recruit the brain’s emotional center to enhance their displeasing quality. Other sounds—waves washing on shore, birdsong, a baby’s babble and laughter—register almost universally pleasant. “There is in souls,” the poet William Cowper says, “a sympathy with sounds.” Mostly, though, our judgments of euphony and cacophony are subjective. Old Testament writers liken the voice of God to hail, coals of fire, thunder, lightning, trumpets, erupting volcanoes; it came encased in whirlwinds, and was capable of “breaking the cedars.” Edgar Allan Poe liked the musicality of L’s and R’s; Walt Whitman liked the muscular strength of K; Dale Carnegie insisted the sound of our own name constitutes our favorite sound; musician Tom Waits likes the sound of bacon pan-frying; writer Anne Tyler, the sound of mothers calling children home from play; some linguists have claimed “cellar door” the most melodious word combination in English. Mostly, I like quiet—not silence, for, except in the vast vacuum of outer space, silence does not exist. In the space of quiet, beneath the clangoring and clappering noise of the everyday, the air hums with a this-sphere music, a polyphony at a lower frequency, coming into earshot, calling for its share of attention, offering itself to our imagination: the shouts and laughter drifting from the municipal pool, the forlorn hiss of tires on wet pavement, the pulsed pump and release of a roofer’s pneumatic nail gun, the lulling thrum of an August afternoon, the rustle of the grain elevator; the faint notes of Rascal Flatts’ “Lonesome Road” slipstreaming from North Park; the sigh of falling leaves, a startled jostle in the bushes—all the hidden also-sounds, the staved underscore of our nights and days, within which we live and move and have our being.